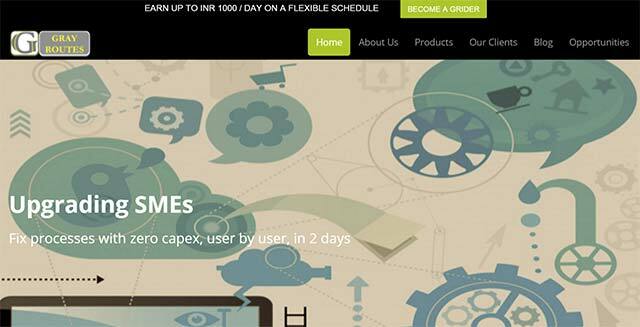 Gray Routes Technology Pvt Ltd, which provides last mile logistics technology solutions to B2B and B2C firms, has raised an undisclosed amount in its second round of funding from Mahesh Parasuraman, co-founder of VC firm Amicus Capital, Rahul Gautam, a Hong Kong based investment banker and a group of angel investors from Carlyle Group, Gray Routes' co-founder and CEO Soubhagya Sahoo told TechCircle.in. This round also saw participation from existing investors. It had earlier raised $100,000 from a group of unnamed angel investors in Bangalore and Silicon Valley, in July 2013. The new funds will be used for international patent protection, developing data analytics capabilities, and for domestic expansion, he added. The startup was founded in April 2013 by Sapna Patel, a Teach for India fellow who has earlier worked with Google, and Soubhagya Sahoo, an IIT-IIM alumnus who has previously worked with Hindustan Unilever Ltd.
Gray Routes, formerly known as Gray Routes Innovative Distribution, provides real time data analytics service to help its clients make better decisions pertaining to sales and marketing. Along with sales force mapping, the company has developed priority clustering based route optimisation, demand visualisation heatmap, automated map based task assignment, data sync techniques, vernacular language engine for navigation for the last mile workforce. It counts FMCG giants such as P&G, Nivea and GSK besides small and medium enterprises such as ADF Foods, PID, RROPL, Restless and others as its clients, and claims to have 400 per cent year-on-year growth. The company has over 26 patent claims for its SaaS solutions and has developed automated patent-pending planning systems that can be used to plan, optimise, coordinate in real time and execute work by sales managers and last mile workers. In the data analytics segment, Gray Routes competes with Ratan Tata-backed Infinite Analytics, Aureus Analytics and Convergytics.